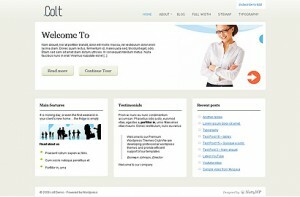 Colt is a business premium WordPress theme from NattyWP. You can create number of additional widgets to represent any company. Colt template will most definitely make the impact you need. Change any of background and text colors, insert images and build your alternative unique style. * Amazing clean business layout with customizable (widgetized) homepage. * You can present a list of services or benefits of your company using special pages scroller section on the home page. You can specify the pages to display in the Theme Options panel. * Blog template to setup and configure your blog section separately. * Networks widget lets you display all the popular social networks. Stay connected. * A completely widgetized sidebar with custom widgets included in the theme packaging. * Completely CSS color controlled, offering you the most flexibility and the easiest customization, allowing you to change the colors of your entire site on the fly in seconds. * 7 custom NattyWP widgets. * Unlimited number of styles. * NattyWP Personal Networks – widget lets you display all your social network profiles in one spot. * NattyWP Banner – Banner widget lets you manage your banners across the site. Widget has its own settings and can be easily configured to display the following formats – 728×90, 468×60, 234×60, 120×600, 160×600, 120×240, 336×280, 300×250, 250×250, 200×200, 180×150, 125×125. * NattyWP Combo – This widget lets you manage 125×125 banners. * NattyWP Adsense – Adsense widget is an analogue of the Banner Widget for placing sets of Adsense advertisements on your site. Widget supports all popular formats used by Adsense. * NattyWP Flickr – This widget lets you add photos from your Flickr profile. * NattyWP Twitter – This widget lets you display latest Twitter updates on your blog.